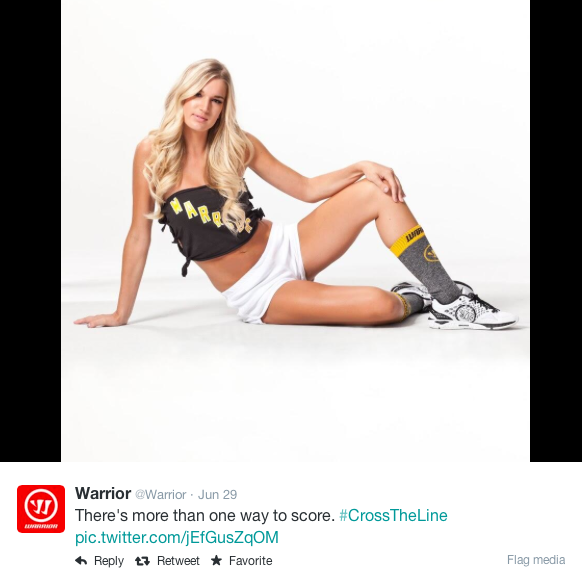 It was recently brought to my attention that Warrior is a horrible company. When I say “horrible” I don’t mean that their equipment is horrible. This is the same Warrior worn and used by Alex Burrows, Shane Doan, Ilya Kovalchuk, Henrik Zetterberg and Alexei Kovalev among others. 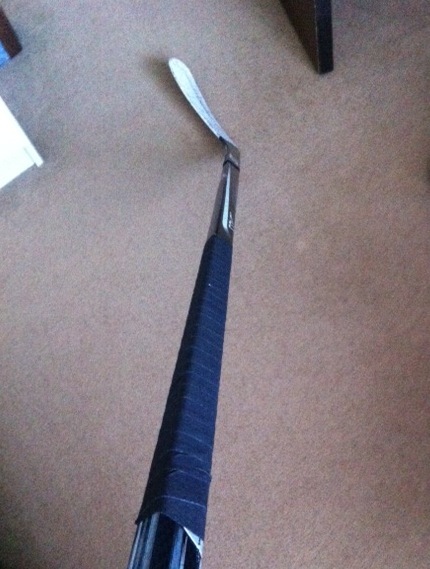 I myself purchased a Warrior Covert DT1 a few months ago. I love the stick, but I no longer love Warrior. And, unless they change their sexist and misogynistic ways I will no longer be consuming any more Warrior products. I encourage you to do the same. So, okay they don’t make women’s gear – they have made that abundantly clear. And no one is asking them to go out of their way to include women. But then why does Warrior go out of its way to make women (or men shopping for women) with the intent of purchasing its equipment feel like crap? I’m going to go out on a limb and speak on behalf of all women athletes and tell you right now, we already feel like outsiders so there is no need to rub it in. We know that there are very few women’s specific items on the shelves. We know that even if we find something in a men’s that we like it probably won’t come in an appropriate size for us. We know that hockey, lacrosse and soccer (the three sports that Warrior deals with) were not made for us. No need to put it in writing. 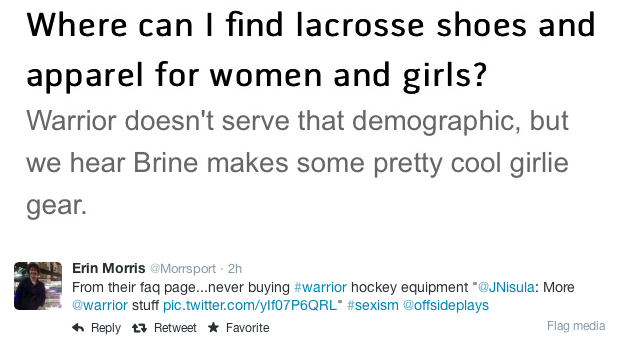 Not only are women not welcome to shop for Warrior items, unless it is for their boyfriend, but women’s sport is generally laughable. To find out more about their 18th century tweeting skills you can check out this article from the Score, Warrior’s Gender-Motivated Tweets Spark Outrage. 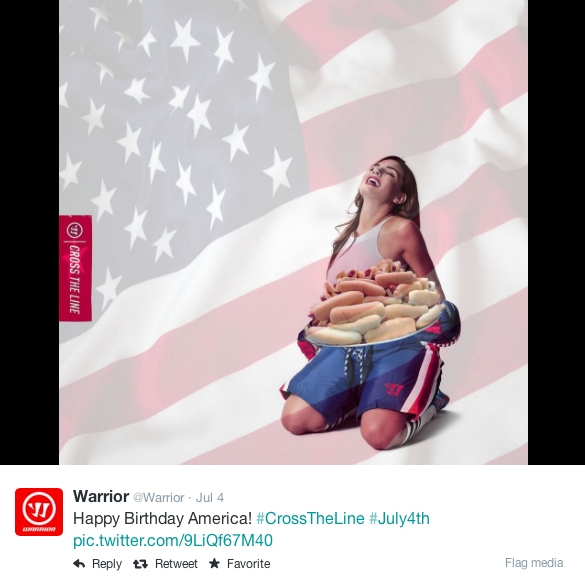 Warrior never apologized for its comments, it merely clarified its position with more sexism and then later on removed the tweets. I found out that Warrior seems to be under a constant barrage of feedback about its operating style but it refuses to budge. So I decided to start a social media campaign. A couple of months ago I created a Twitter account called Offside Plays (@offsideplays) to catalogue and call out everyday occurrences of sexism, homophobia, racism etc. in sport. It is designed as a safe space where people can learn about the discrimination that others encounter in their own lives and serve as a possible site for research. Currently, most of what I do is promote articles on discrimination but I am hoping that once it gets big enough people will be able to share their own experiences (so far lots of shares about sexism encountered while cycling and running). On Friday I called on all hockey, lacrosse and soccer players who have Warrior gear to tape over their logos and send in the picture to Offside Plays with #taped. It is a small gesture, I know. But asking people to burn hundreds of dollars of equipment isn’t realistic. We can, however, make sure that Warrior knows that their next quarter, and all subsequent financial statements are going to take a hit. If you have Warrior gear please join our stand against sexism and misogyny and tape over your Warrior logos and either send the picture to @offsideplays or load it on the Facebook page. Warrior needs to understand that freedom of speech is not the same as consequence free speech. Please join me in making Warrior accountable.